Are Infographics more than just colors and information? Commonly defined as colorful shapes and information put together to explain those boring numbers aesthetically. There’s no secret about visual content working, it does, but to what extent? Are infographics really effective? Do they help drive traffic to the website? Infographics are like well designed quotes – insights, designed well. Therefore these get liked and shared on social media 3 times more than any other content. Shareability being an important objective while creating content, increases the chances of readers landing on your website. While every marketer tries to design infographics well, one also needs to remember that the information represented is worth the audience’s time. Since Infographics contain a lot of information, these are considered as an integral part of a B2B marketing plan. 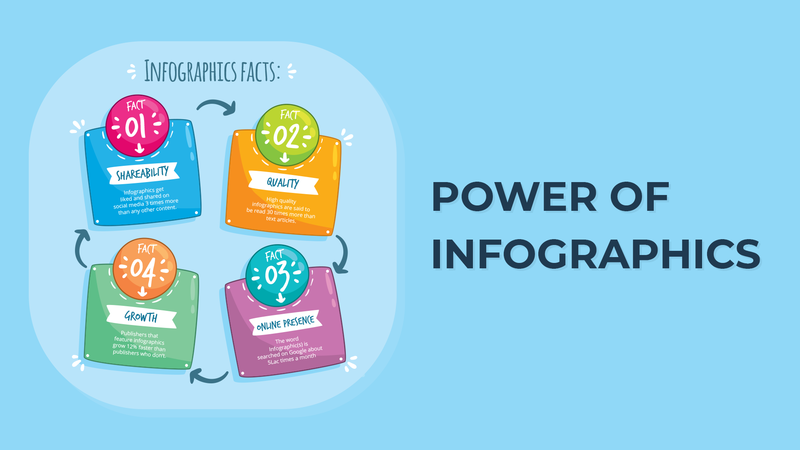 High quality infographics are said to be read 30 times more than text articles. Audience looking to consume B2B content are generally considered to be those who spend more time sifting through relevant data. Smart marketers embed codes in the infographics for the audience to land onto the source. The average page visit lasts under a minute. Unless you grab the reader’s interest, he/she will glance over your page and move on to the next site. Infographics are the therefore the perfect hook. Publishers that feature infographics grow 12% faster than publishers who don’t, and of course mentioning the website url or linking it back to the website is therefore key. The word Infographic(s) is searched on Google about 5Lac times a month, and about 0.2M users view the hashtag ‘Infographic’ every hour on Twitter. Imagine the opportunities brands are missing out on. While designing an infographic may not be relevant for every brand, there are multiple statistics available over the internet that suggest infographics should be a part of one’s marketing plan. While there are a million infographics available across the internet, and to increase traffic every marketer tries to design one, what makes it important is to decipher between an infographic and a good infographic. Reputable sources of data and keeping a balance between the design and data are important, each play an important role in attracting the audience. Apparently triggering emotions through an infographic increases sticky-ness! In the early days of KISSmetrics, they focused on written content only. Once in awhile, they created a video to help spread the news about their software and raise brand awareness. For the most part, their content was written. It is evident that infographics surely worked for them! This case study and the statistics do suggest Infographics become part of most Marketing Strategies. We at Socioar believe the same.